(CNN) -- Rafael Nadal made light work of former world number one Lleyton Hewitt to reach the fourth round of the French Open on Friday. 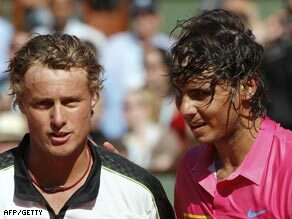 Nadal (right) and Hewitt congratulate each other at the end of their match. Nadal, bidding for a record fifth straight win at the clay court grand slam, beat the Australian 6-1 6-3 6-1 to reach the last 16 in Paris. It was the 31st straight win at Roland Garrod for the top seed and he was rarely troubled by Hewitt who has never gone beyond the quarterfinals in the tournament. Nadal secured two early breaks on his way to taking the first set in half an hour and claimed Hewitt's service again at the start of the second. But Hewitt, who came from two sets down to beat Ivo Karlovic in the first round, broke back to tie at 2-2 before losing his serve again at 3-3 as Nadal wrapped up the second set. There was to be no repeat of his Karlovic heroics for Hewitt as his 22-year-old opponent breezed through the third set to win in just under two hours. He will play Robin Soderling in the fourth round after the Swede beat his Spanish compatriot David Ferrer in four sets in a later match. Earlier, another Spaniard, Fernando Verdasco won a hard-fought clash against compatriot Nicolas Almagro 6-2 7-6 7-6, needing nine match points to close out victory. He will now play Nikolay Davydenko for a likely clash with Nadal in the quarters. World number three Andy Murray of Britain also made it to the last 16 where he will face Marin Cilic of Croatia, the 13th seed. Murray beat Janko Tipsarevic when the Serbian retired as he trailed 7-6 6-3 with a thigh injury. Murray trailed 5-2 in a topsy-turvy opening set before hitting back to take it in the tiebreak and forge ahead.